I was particularly observant with regard to his reactions to my questions and to his overall demeanor during the repeated questioning. The patient responded promptly to all questions. He did not appear to take questions lightly on the one hand, nor did he appear to be extremely apprehensive on the other hand. He was questioned intensively as to who he felt might have committed the crime. He had no specific comments with regard to specific individuals. The patient did mention that there had been some kind of prowler in the area some time prior to October 30th. [Tommy] was queried on a point by point basis as to the events that had taken place on the night of October 30th and on October 31st. He was repeatedly questioned with regard [^] his attitudes and emotions prior to, during and since October 30th. 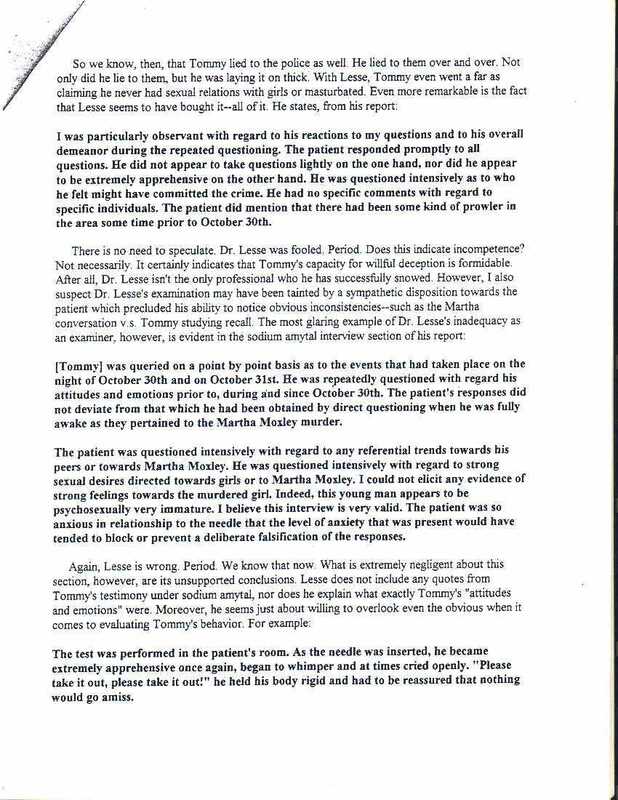 The patient's responses did not deviate from that which he [sic] had been obtained by direct questioning when he was fully awake as they pertained to the Martha Moxley murder. The patient was questioned intensively with regard to any referential trends towards his peers or towards Martha Moxley. He was questioned intensively with regard to strong sexual desires towards girls or to Martha Moxley. I could not elicit any evidence of strong feelings towards the murdered girl. Indeed, this young man appears to be psychosexually very immature. I believe this interview is very valid. The patient was so anxious in relationship to the needle that the level of anxiety that was present would have tended to block or prevent a deliberate falsification of the response. The test was performed in the patient's room. As the needle was inserted, he became extremely apprehensive once again, began to whimper and at times cried openly. "Please take it out, please take it out!" he held his body rigid and had to be reassured that nothing would go amiss.